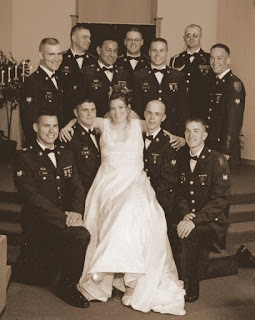 It’s been 11½ years since that day we were married. It was sunny and hot and I had the future on my mind. We were young and scared. We had three months of “couplehood” left before we were going to be parents. 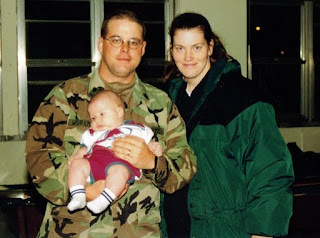 More than anything, I was joining the ranks of Army Wives everywhere and I had no idea what I was getting into. The first day you went back to work after our honeymoon, you received news that sunk your heart. So much so, that you didn’t tell me right away; you didn’t want to upset your very pregnant wife. You always protected me, even when I didn’t know it. Later I would find out that you were PCSing to Camp Hovey in South Korea in the spring. In the meantime, we needed to get ready for a baby. Little did I know you were quietly suffering because you knew you would leave us for a year. On September 14, 2000, my water broke at 11:30pm as I laid in bed. You rushed through all the motions of an expectant father tasked with an emergency run to the hospital. I don’t remember a lot of it, but I remember you drove very fast toward Fort Riley and you were excited. At 3:50 am on September 15, we welcomed Gabriel Kennedy into the world. Complications caused me to be asleep during the c-section, so you welcomed our son by yourself. I don’t remember the first time I saw Gabe but I remember how elated you were to have a little boy. In the weeks that that followed, you took such good care of Gabe and I...your cherished family. Fast forward through our first Christmas and into 2001. March came and you prepared to PCS to South Korea. I was frightened about your being away for a year. Gabe was only 5 months old...he would be 18 months old when you returned home. How much time you would miss! I was heartbroken for all three of us, but I knew we were strong and we’d make it. Besides, you had mid-tour leave in September, so I only had to get through six months. September came. Saying I was excited about your mid-tour leave would be muting my feelings a bit...I was ectatic! Gabe was almost 1 year old and we were looking forward to celebrating with you. He had grown so much and I couldn’t wait for you to bond with your son. Then, the unthinkable. September 11, 2001...our world was thrown upside-down. Terrorists had attacked the World Trade Center and suddenly we were thrust into war. I was as scared as everyone else, but I was worried about you. I waited anxiously for your phone call...it finally came. You were headed to the DMZ to stare at North Korea and hope to God they didn’t take the opportunity to strike. Oh, and by the way...your mid-tour leave was cancelled. I was too scared to be heartbroken, but I was missing you terribly. Four days later, on a cold and rainy Saturday afternoon, we celebrated Gabe’s first birthday. He was going to have a wonderful cake with his favorite characters on it, but instead it simply had an American Flag. I wanted it to reflect our vigil of honor...his daddy was guarding freedom outside of the world’s most pristine ecosystem. Machine guns, Bradleys and miles of wire fence...that’s what you were doing when your son turned One. 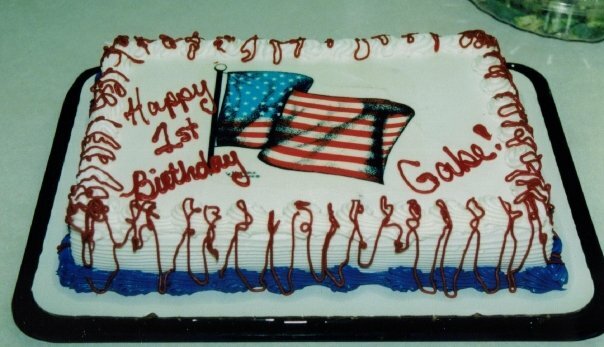 To this day, Gabe knows why his cake was a flag and I’m glad it was. Finally, you returned to us. The world was a very different place than it was when you had left a year before...but we settled right back into family life. We were thinking of expanding our family, but i wasn’t our time yet. We carried on and soon we found that you had received orders to deploy as part of Operation Iraqi Freedom. Although you were not excited to leave us again, you knew it was your duty. You told me that you had trained your entire career for this and you wanted to go. April, 2003. You were Baghdad-bound. This time, I was very scared. Scared of “the knock”, scared of phone calls, scared of what could happen. I talked to you about once every two weeks at odd times early in the morning. It was always so wonderful to hear your voice. There were no emails so we exchanged hand-written letters. It was tragically romantic. One day I received the message that you’d been hurt. The communication was sketchy and thankfully you were not injured as badly as I’d feared. However, the stoploss was lifted and you were sent home, against your wishes and better judgement. I didn’t understand then...I didn’t know why you wanted to stay. Soon after you were back from combat, you were out of the army. All of a sudden, we found ourselves a civilian family and you a veteran. We were both scared but we never talked. You were quiet and seethed of anger. I wasn’t sure what was happening...I didn’t know what you had been through in Iraq. I didn’t understand that your unit was still there and you were scared for your men. I just didn’t understand. 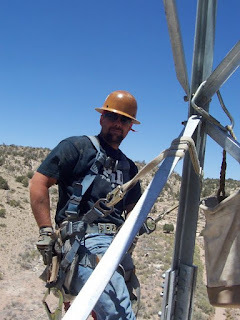 You took a new job as a tower hand and traveled all over the country building cell phone towers. The money was good, but you were gone again. I was accustomed to you being away so I pulled it together and managed. I missed you, but I comforted myself with the knowledge that you would someday be in an office and home every night. We’d have family vacations like everyone else and dinners around the table. That was my fantasy. Soon, we found out Jackie was on the way and you were excited to have a Princess. I’ll never forget the joy she brought to you, it was beautiful. I’ll admit now, I was a bit jealous of how emotional you were with her...because you never were that way with me. You simply never were able to let your walls down. I wish I would have realized that you just couldn’t. That it had nothing to do with me. You called me one morning in May, 2005. You were out in Western Kansas, heading back to Topeka. You were in pain you said, you thought it was Appendicitis but you were going to try to get to the VA in Topeka. Finally, you made it. I was worried. I rushed to the VA, just to find you sick as you could be. You were rushed into emergency surgery. Hours later, we learned it wasn’t Appendicitis, but rather Diverticulitis. I was confused because you were only 30 and this is something elderly people get. I watched your grueling recovery for 10 days in the VA. You were miserable and in pain. Finally, the day before our fifth wedding anniversary, you were released. The next day, we spent our anniversary at the grocery store with you leaning carefully on the cart as we walked through the aisles. It was all you could manage and we came home. But it was the most romantic date we’d ever had and I still cherish it to this day. Not long after, your dad fell ill and you were worried. He had been sick before but this time was different. He was weak and wasn’t responding to treatment. I watched you suffer as he suffered. 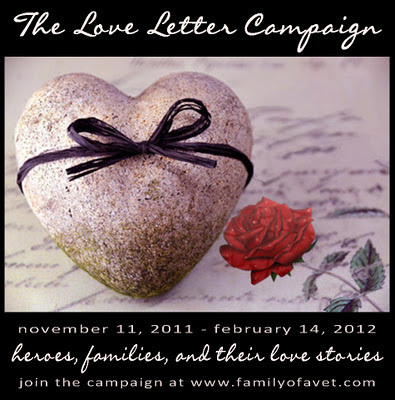 I watched you hold vigil at the VA and then at the Hospice House. 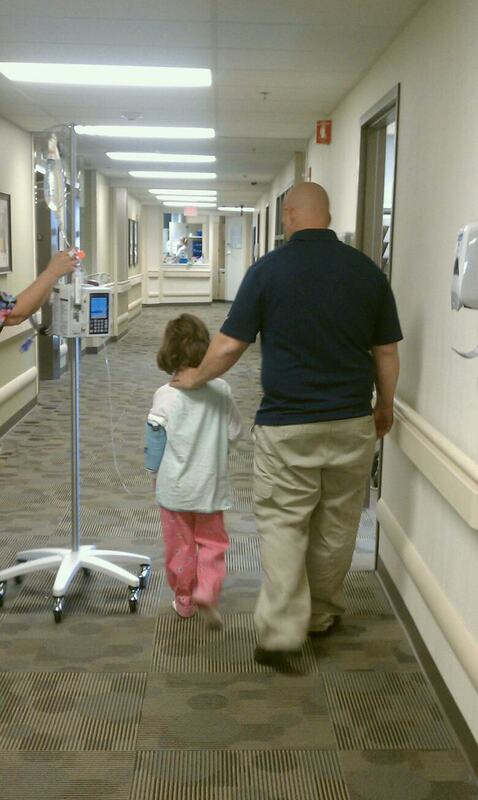 I remember the early morning phone call, when all you said was simply, “dad is gone”. I was heartbroken for the loss of an amazing man and I was heartbroken for you. Time went on and you rose in the ranks of the telecommunications industry. You were a supervisor and you were well-respected. We saw you every so often when you could get back home, but those visits became increasingly more tense. I didn’t understand, but I knew we were falling part. So did you. I know we were both scared. We had our good times and I held onto those like a treasure. I remembered what things made you happy...simple things like A&W Root Beer, homemade cookies and a quiet nap. I tried to make you as comfortable as I could. Most times, though, I was aware that I was failing miserably. Not long after, William joined us. You were on the road and didn’t get a chance to spend as much time with him as you would have liked, but I knew you loved him. I took solace in the simple fact that he had your eyes. Life became more and more tense. 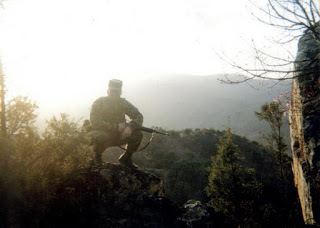 I knew something was wrong but no one had ever told me to look out for anything after combat. I finally realized it must be PTSD. You weren’t ready to deal with it so you worked. You were hurting and you tried to tell me. I was hurting and didn’t know how to tell you without hurting you more. Neither of us knew what to do but we knew we still loved each other. I was confused and mistook your PTSD for a loss of love. I see now I couldn’t have been more wrong. 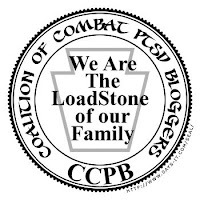 I learned more about PTSD, TBI and Life After Combat. The chaotic life that we had just endured came into clear view to me. I finally saw what you had been fighting this entire time and my heart sank...I wished so badly I would have known. 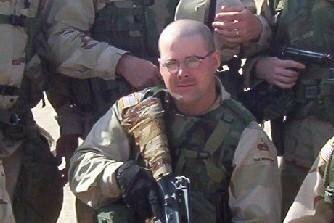 I wish I would have been prepared to deal with what would happen to you in Iraq. I felt for a time as though I had failed you as a wife, but then I learned more. Over time, as you and I slowly and carefully began to wipe the slate clean and start over, I began to see. 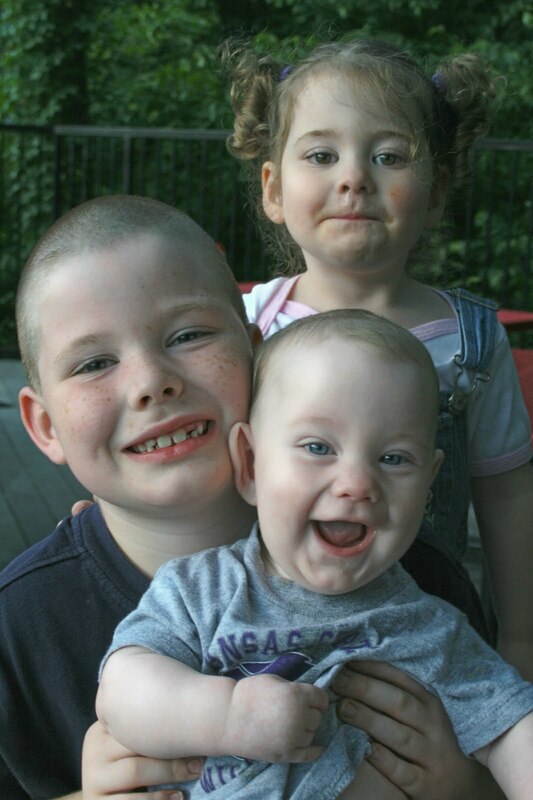 I watched you with the kids when I would bring them to Champaign where you were now living. I saw your love and I began to also notice your subtle cues...I could see when you were being triggered by something or a situation was too much. I fought it for a while...I was sure that I had to succumb to society’s rules about divorce; they were set in stone and they were clear. If you were divorced, you had to be cool and distant with each other. In my heart, I believe I knew otherwise...I believe I knew our situation was different and special. What I didn’t know is that I was to begin a crusade of redefining what divorce is...that it doesn’t mean the end. Just because a marriage ends in the eyes of the law doesn’t mean everything. Did you know...we give hope? Not long ago, as I’ve been working with Family Of a Vet, I’ve noticed something amazing. I’ve noticed that our situation is giving many, many veterans and their families hope. Hope that they can make it. Hope that even if they don’t, it’s okay. They know there are resources out there for them that we simply didn’t have way back in 2003 when your tour in Iraq ended. We know now that the war doesn’t end when you leave the battlefield. Not long ago, our little girl laid in the hospital. You came rushing back to her. I could hear the fear in your voice on the phone as you drove. At 1am when you arrived in her room, you leaned over her fragile sleeping body and hugged her for a long time. I watched you and wondered what must be going through your mind. Over the next few days, I observed you in tense and stressful situations. You came to me and confided that you didn’t know what was the matter...I told you it was okay because I did. I can read your body language now and I know when you need to change scenery a bit. I watched you with the boys and the pride you had as Gabe’s football team was awarded their championship trophies. I also could hear in your voice how hard you were fighting the anxiety of the crowd. Gabe never knew the difference, though...all he knew is that you were there. After Jackie was out of the hospital, you read the get-well cards her classmates wrote her...I saw the wonder in your eyes when you realized how much they cared for her. It was Veteran’s Day and the cards included little flags from the VFW. Her classmates also knew you were a Hero. Regardless of where life takes us, we can look back to were we’ve been. I love the man you’ve been, the man you are and the man you are working so hard to become. I am proud of you and your service to this country. I’m proud of how you’ve soldiered through all the years since your tour in Iraq. I’m sorry I didn’t know more about your suffering back then, but I do now and I’m here to walk with you the rest of the way. The words of this stanza have always reminded me of us. Life has changed...it’s been rearranged...and it’s definitely been disassembled. We’ve broken each other’s hearts and we’ve come back together. We’ve learned how to take pieces of a broken life and begin to re-shape it. Stronger and better than all those years ago. Remember when?